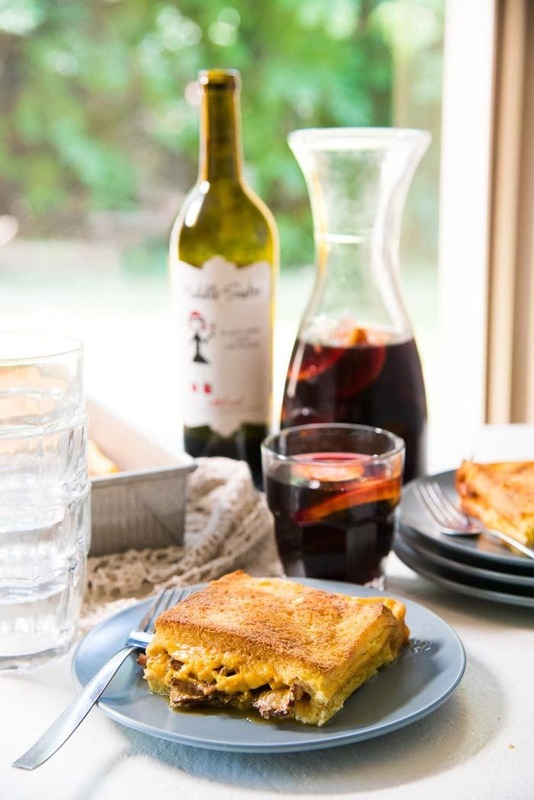 Slices of soft brioche bread, filled with bacon and American cheese, and soaked in an egg custard, and baked until brown and crunchy on top – this Bacon Grilled Cheese Sandwich Casserole is perfect for a relaxing brunch on weekends, especially when paired with these yummy Middle Sister Wines! So we moved into a new apartment guys! So once we got all of our stuff organized and boxes put away (ah, who am I kidding? The place is still a mess. But it’ll get there eventually, I’m sure. Pretty sure. ), I was in need of a ME day, where I didn’t do ANYTHING but catch up on Netflix and Hulu with lots of wine. But we still had to eat. 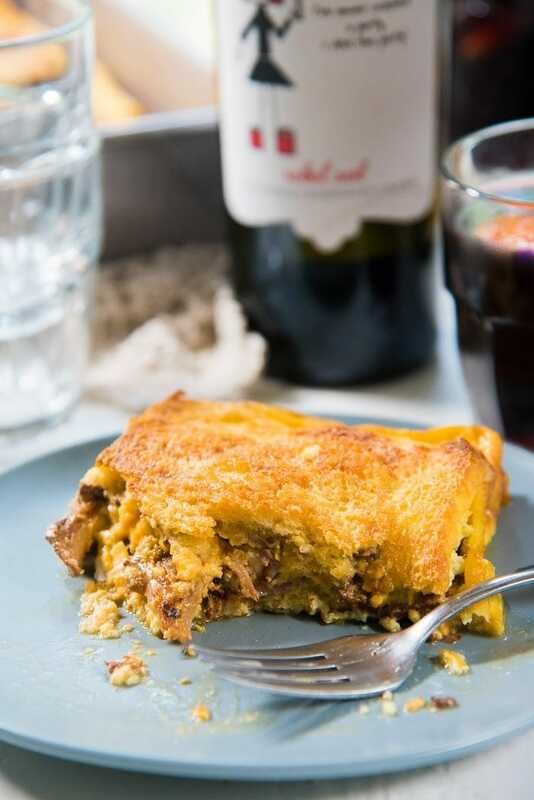 That’s where this super easy casserole came in real handy – a Bacon Grilled Cheese Sandwich Casserole, paired with an amazing Red Wine Sangria! 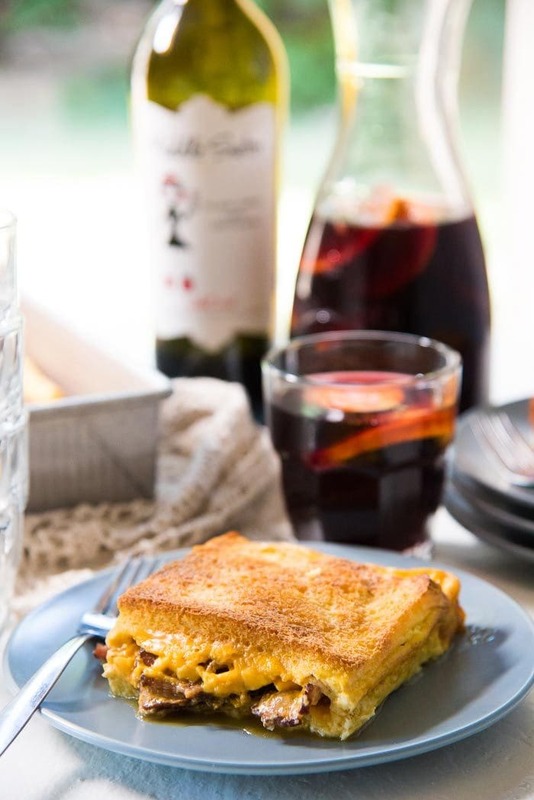 We literally spent one entire day enjoying nothing but this bacon grilled cheese sandwich casserole with glasses of Middle Sister Red Wine Blend, elderflower and gin sangria. What a glorious day! If you like grilled cheese sandwiches, or bacon or French toast, then this casserole has your name written all over it. If you like all three, well then, you’ve just hit the jackpot! 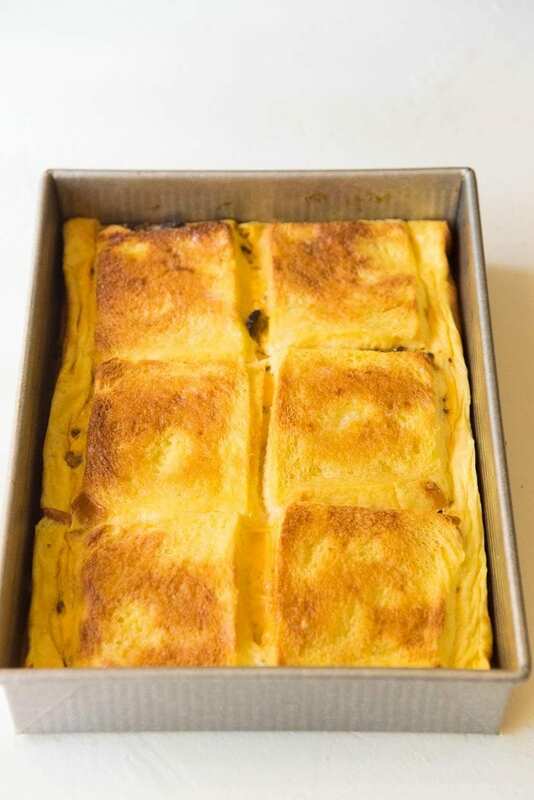 Slices of brioche bread filled with bacon and American cheese, and soaked in an egg custard, and baked until the bread is crunchy on top. It’s an epic breakfast with minimal effort on your part! After an exhausting few weeks of moving and cleaning, wine is the perfect way to unwind! 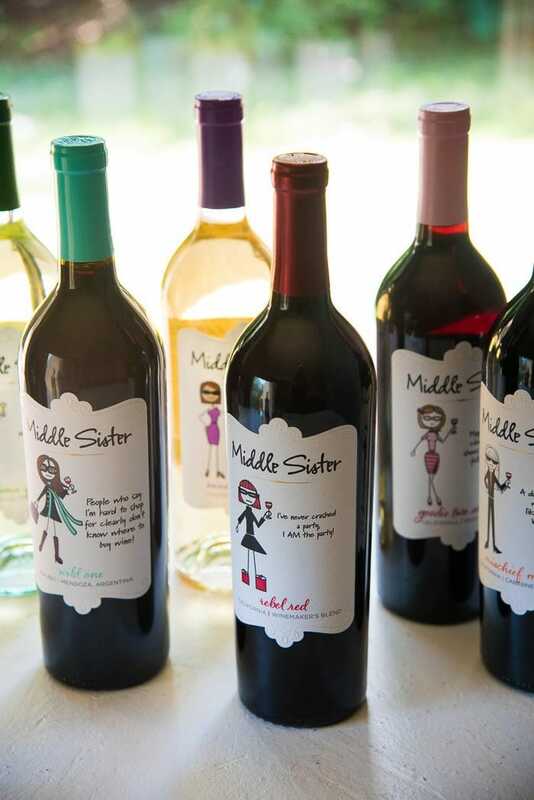 Middle Sister wines had me covered, with 6 varietals to choose from – K’s favorite was the Middle Sister Red Blend, while mine of course was the Middle Sister Wild One Malbec. Making a sangria was also an easy choice. A smooth red wine blend from Middle Sister Wines, mixed with elderflower syrup, mandarin juice, and gin was a great twist on a traditional sangria and the PERFECT summer drink for the scorching hot days we were having. 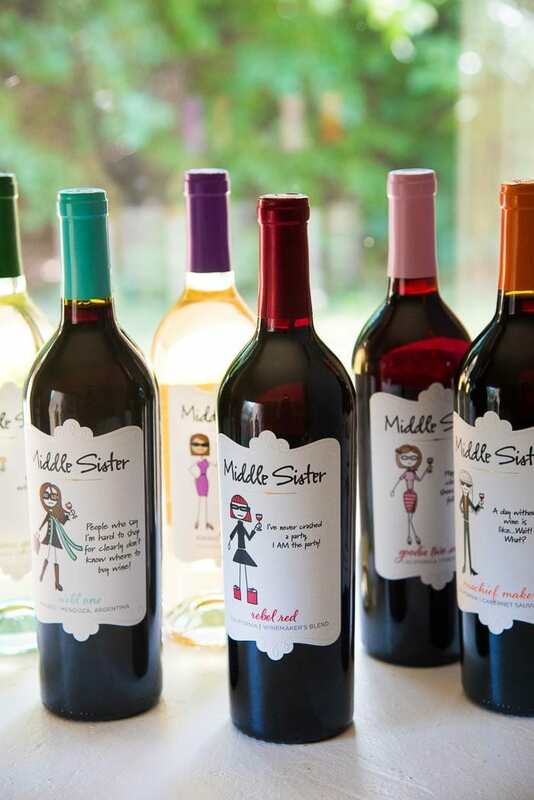 This year, Middle Sister wines turns 10, and to celebrate, the brand is hosting a monthly Kate Spade Purse sweepstakes! 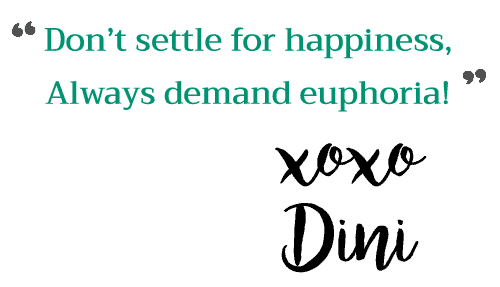 So YOU too can be in to win a Kate Spade purse this month by entering the Middle Sister giveaway! As for the bacon grilled cheese sandwich casserole – a special “YOU day” isn’t complete without great food and delicious drinks! That’s why I love this easy casserole. It’s no fuss, perfect for brunch, and you can have the leftovers for dinner! I prepped this casserole the night before. Here are some tips to make prepping even easier. I cooked the bacon in the oven, so that I could cook it all at once. But you’re welcome to cook the bacon any way you like. I do prefer bacon. But to make this even easier, you can buy some ham instead. You can even use roast chicken slices, or turkey slices. Since lunch meat requires no prior cooking, you can assemble the casserole with more ease. Buy pre-sliced bread. I used pre-sliced brioche bread, but any kind of bread is OK. You save a little more time and effort when you use pre-sliced bread, and I’m all about less active time cooking when I’m planning for a relaxing day. However you feel about processed cheese, you can’t deny that a grilled cheese sandwich made with American cheese slices is AWESOME! It’s not a fancy cheese, but it tastes delicious when melted, and it’s the foundation of a classic grilled cheese! Plus, it’s already pre-sliced, so you don’t have to spend time slicing and grating. Pour the egg-milk mix into the dish as well, and keep the dish covered in the fridge overnight! So all you have to do the next day is to bake the dish in a preheated oven until the top is nice and golden brown. 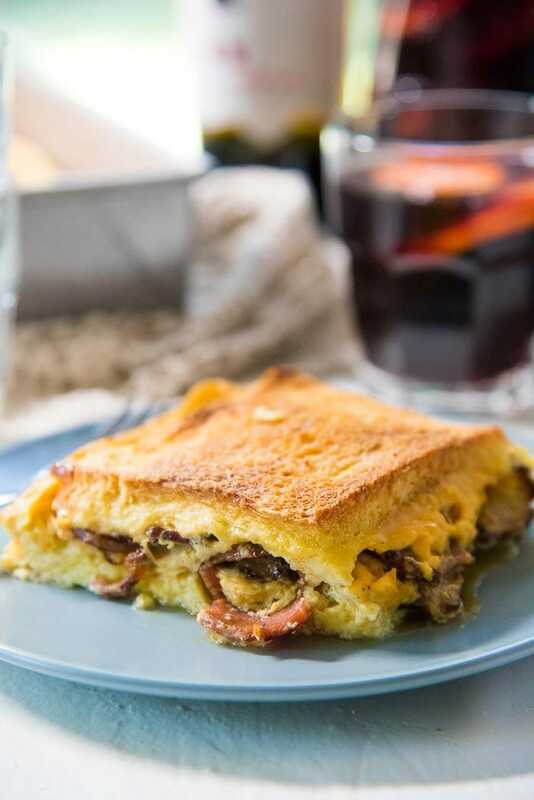 If you liked this bacon grilled cheese sandwich casserole recipe, don’t forget to subscribe for new (and free) recipes by entering your email address on the side bar (and get all these recipes delivered straight to your inbox), so you don’t miss out on a thing. You can find me on FACEBOOK, TWITTER,INSTAGRAM, PINTEREST, YOU TUBE and GOOGLE-PLUS too. 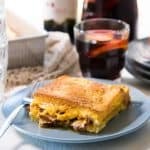 Bacon Grilled Cheese Sandwich Casserole - a delicious, make ahead breakfast casserole (or brunch casserole), that's easy to make and perfect for lazy mornings. Cook the bacon slices to your liking. In the oven - preheat the oven to 400°F / 190°C. 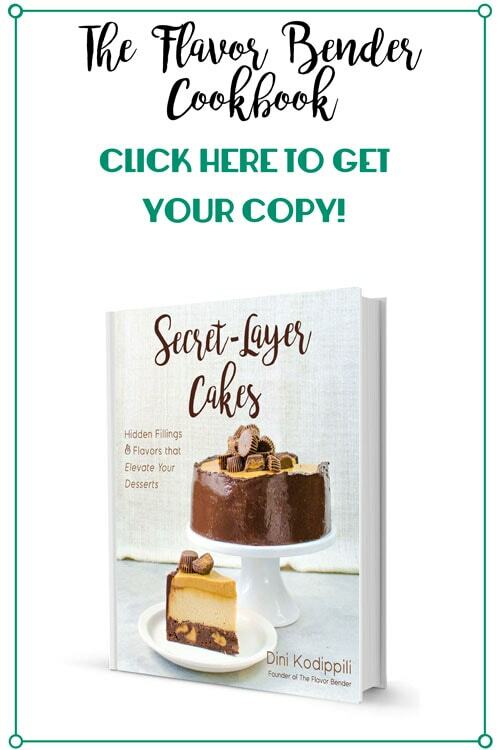 Place a wire rack over a foil wrapped baking tray. Lay out the bacon strips on the wire rack. Cook the bacon in the preheated oven for about 10 - 15 minutes, or until they are cooked to your liking. The time will vary depending on the thickness of the bacon. Remove the bacon from the oven and let it cool. Cut the bacon slices in half. Butter a 9 x 13 dish. Place 6 slices of bread inside the dish. You can choose to cut the edges or not. Butter each of the bread slices. 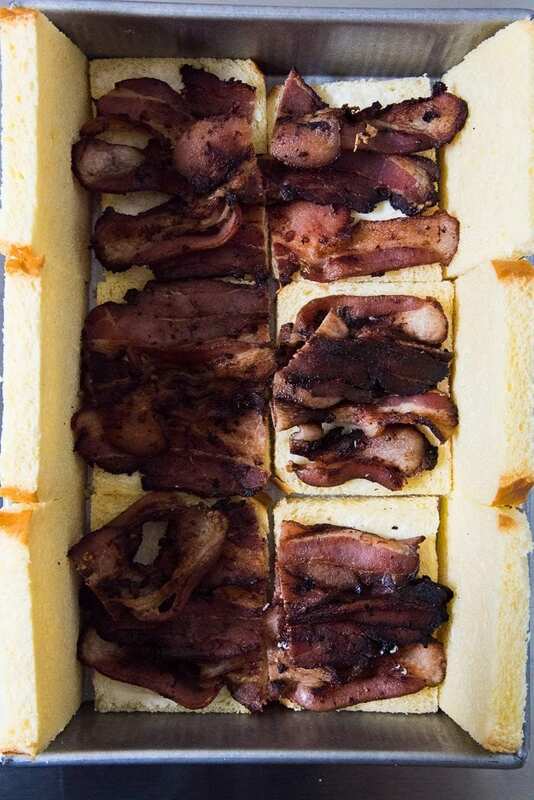 Place the bacon over the bread slices. 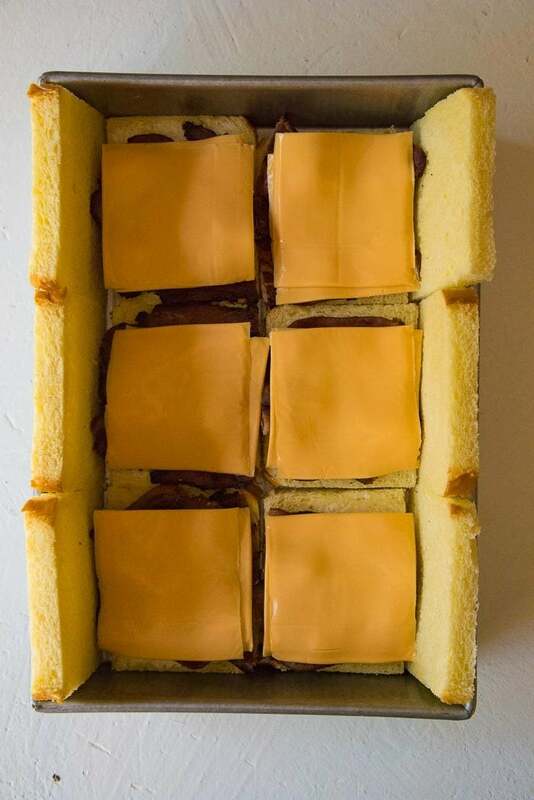 Top up with the cheese - about 2 slices over each slice of bread. 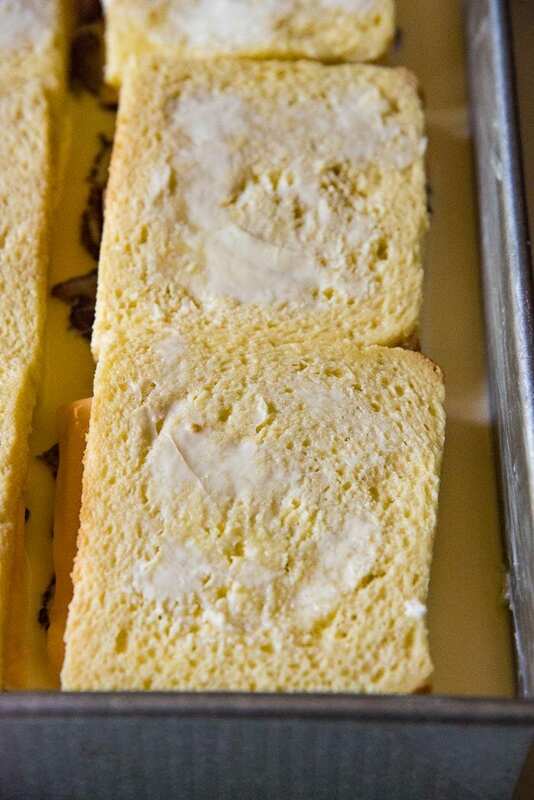 Top with another slice of bread, and butter the top of each sandwich. Whisk the milk and eggs together to make a smooth egg - milk mix. Add a generous pinch of salt and whisk to combine. 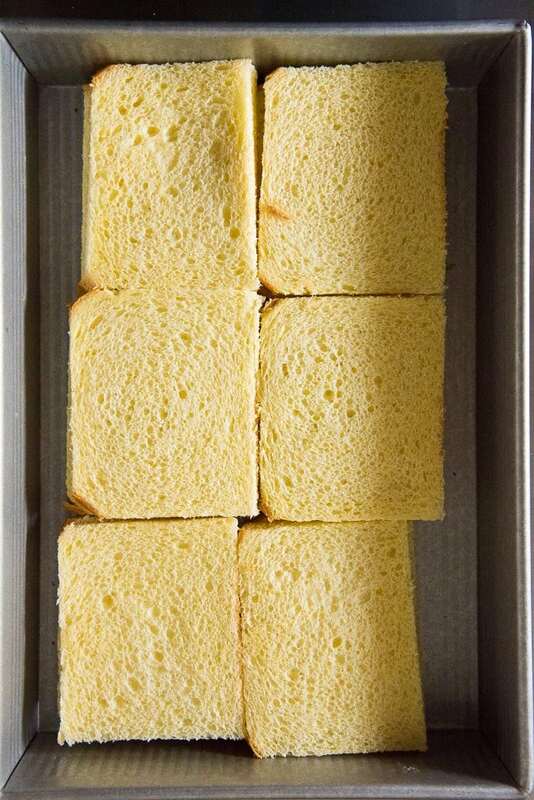 Pour the egg mix evenly over the sandwiches. The egg mix should come half way up the sandwich casserole. Leave for at least 20 minutes before baking. OR cover the dish with plastic wrap and leave it in the fridge for no more than 8 hours. Preheat oven to 350°F / 180°C. Place the casserole in the oven (without the plastic wrap! ), and bake for about 40 to 45 minutes - until the top is golden brown. Remove from the oven and let it cool slightly. Cut and serve while warm. Juice 3 mandarins, and remove the seeds. Slice the other 3 mandarins, and then transfer the juice and the slices into a large jug. Add the gin and elderflower syrup into the jug. 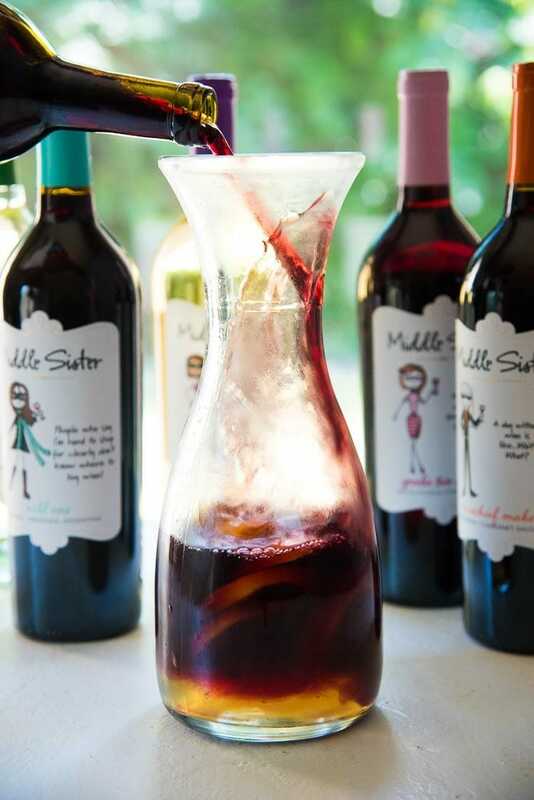 Pour 1 bottle of Middle Sister Red Blend wine into the jug and mix well to combine. Place the jug in fridge to chill overnight.